Several prophetic warnings regarding Germany have been shared in the past few weeks, as listed below. At that time, the DAX was at 10,259, so it would have to drop 16.2% to get to 8,600. However, it closed on May 16 at 9,952.90, so it has already dropped by 3% in the past three weeks. Since JW saw the German cars moving up to the top of the hill, my interpretation is the DAX is going to make another top before crashing. The previous top for 2016 was April 20, the same as the Dow. Just as we are expecting to see the Dow make a steep climb over the next few days, the DAX is likely to move up at the same time. So the fulfillment of this dream could be coming very soon, or perhaps there is another steep climb coming at a later date. JW’s impression that the powerful BMW represented FAZ sounds right to me because it is a high-powered investment vehicle, which would lose value (lose power) when the markets move up. However, the BMW still had some hope of sliding down the grassy hill while the less expensive VW, which he felt represented options trading, had much bigger problems, demonstrated by the clamp preventing it from going down the hill and the driver getting very upset. It sounds like a major market disruption. In January 2015, Z3er Michael Perritte received a prophetic dream revealing a coming crash in the North Dakota oil fields followed by a crash in Germany. In his dream, the two crashes were separated by a shift in the classroom he was in. Just one month later, in February 2015, the oil fields started collapsing, resulting in many people losing their jobs. Michael felt the shift in the classroom represented the transition from one school year to the next. We now have just a few weeks remaining in this school year, which means the collapse in Germany could be very soon. The details of Michael’s dream were including in my previous post, Prophetic Dream: German Economic Collapse Coming Soon. The western financial system is a house of cards termporarily held together by lies and manipulation. Buried in unprecedented levels of debt and exposed to unprecedented risks of heavy losses from financial derivatives, it is only a matter of time before the system crashes. The recent increase in prophetic warnings suggest the time could be soon and market disruptions could be severe. While the crash would be bad news for most investors, it does not have to be bad news for everyone. There are ways to make profits from the downturn through inverse ETF’s, like FAZ and UVXY. A crash in Germany would put immediate downward pressure on the euro, which represents another investment opportunity, not only for forex traders, but also for investors in the stock market through ETF’s like FXE, which targets the EUR/USD currency pair. Buying shares outright would not be a good idea since it moves in the same direction as the euro, which is likely to go down. However, put options are available for FXE at very low prices. Options trading is always high risk, but perhaps even moreso in this case if JW’s dream was interpreted correctly. As always, these comments are not recommendations for investing. This information is provided as a starting point for prayerful consideration about what to do about it. Yes and a member of the House of Representatives, but that is about it. I’m no technical guru. I can’t figure out how to post articles from my phone. Going to ask my daughter how to do it. Yesterday Zero hedge posted an article about UVXY and other etf’s. They are at an all time high ever!!! Some one is betting this market is going to crash. A lot being observed of the latest George Soros move, do folks realize he joined the Nazis at age 14. He has said it was the best time of his life. Soros has crashed countries economy’s and as taken enormous gain for himself.. He is an economic hit man of the highest order and plays in the shadows. From Dave Hodges writing , food to throw on the table and chew on. Soros does not due things on a whim . Things are manifesting fast, more road signs. Nita Johnson writes that Soros also paid dearly for the Obama election fraud to occur. The only thing God is telling me for some time is to stock up on food & water….you can get gold or silver, but that ain’t going to help! It’s not going to be like you have gold so you can go do some groceries, the famine will be real, so people are going to loot! The only thing to stock up is food, water, blankets, medicine, the simple things, not to make a peofit out of the falling/crashing markets…. What about the new underground economy , black market, that will be created.? All through out history when things go wild weasel a new black market is formed. Gold for bribing and silver for barter. Example today of the creative underground economy. I am not endorsing fraud, just making a point. What is your suggestion for preserving temporal wealth? On 4/30/16 while pondering Z-3 dreams and market activity; the Lord spoke to me: “I have shown you things also. The crash has already begun. It will come in 3 waves” (from a dream on 1/30/16). “You look to the DOW and don’t see anything. Look to the global economies for this is global. It’s in the Dow also but being hidden by manipulation” In the dream (on 1/30/16) people were all watching this happen on TV and I was given an old fishing lure to find food with. EOD. I was not shown how long this will take to unfold but people will be desperate at the end of it. Hi Gary Lee: Any idea about what might be a good indicator for watching the global economy as opposed to watching the DOW? You did not pose the question to me, forgive me if it seems I’m barging in. The global economy is, of course, composed of national economies. For a global picture, I suggest IMF global “growth” revisions, and the major economies’ individual GDP revisions. (Never projections.) I know that most everyone suggests that they’re all fabricated, and to some extent I agree. But, the slope of the revisions is the tell. Baltic Dry Index is a simple factor to examine. Additionally, look at absolute import and export numbers from the major economies. For example, China’s imports and exports have both been dropping for multiple quarters. Since the USA is still, by far, the world’s leading economy in absolute terms, I suggest the U.S. labor force participation rate, energy usage, and miles driven. I think this small handful of things gives a good feel for the real economy of the world. Equity indices are not economic indicators, at least not in this day and time. This is very helpful info. I’m not all that knowledgeable on economics. My dream corresponded with James 1 month delay Jan 30 2016 and lines up with James 4 seasons macro view. No idea of what the 3 waves equate to but assume its global in nature rather than DOW movement (which will also be affected). I’ll begin to watch these. For a long time I felt in spirit that there will be hunger in America. Only one person listened, who was a stranger, I felt they needed to hear it, asked me if I was a prophet. I said no, I just felt you needed to hear this. She answered that is very strange as she recently moved with her family and felt the need also to stock up on food stuffs but had not acted on it. My reply was: ‘You got your confirmation’. I was listening to the CBC radio today as they were talking about “wheat blast” fungus in Bangladesh. Rick Wiles also spoke of famine coming. David Wilkerson spoke of tripping over dead bodies in the street who died of starvation.Michael Boldea spoke of a wheat field of which 1/3 was burned by fire (present way of eradicating wheat blast). GERMAN BANK DOWNGRADES DEUTSCHE BANK STATING THAT ITS PROBLEMS ARE INSURMOUNTABLE! I was finally able to access this site after a couple hours of “internal server issues”….I have to say I was a bit beside myself not being able to log in. I needed my, “Z3 Family” fix! All is good now…:) I missed ALL of you! Hopefully we will not have any more problems like we had yesterday. Ditto, I was busy all day yesterday with our dog “Fred” who would have died of a bacterial brain infection, had we not taken him to the vet (German Shepherd cross). Slept outside with him on the acreage all night (floor was too slippery for him to walk, as he was always flopping over, and couldn’t stay on his feet; in danger of banging his head on the tile concrete floor). Much better today although the hind legs are still giving way and too wobbly to walk. TomP, I feel the same way! It was driving me crazy. I check this site every hour or more and that little episode was not fun! James, I had a dream about 6 years ago which I may have shared, were this elderly couple that were German lost everything they owned including their house because they had all their money in retirement and the government came in and took it. 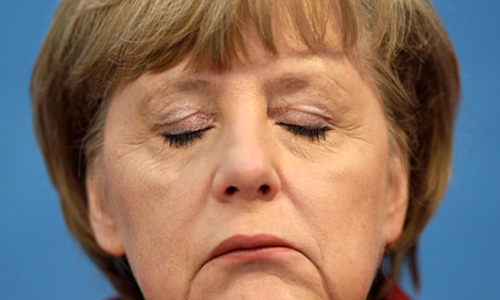 I’m not sure if this has to do with the topic, I’ ve heard that an anonymous put a head of a pig in the Merkel office. All this political issues about refugees, and economical austerity, I think Germany is not as good as they was some years ago, in a economic and political way. Germany is one politic entity, but maybe the dream of BMW and Volskwagen represents the two Germanies (East and West) since the moment till today there are significant diferences between both of them. As a seasoned businessman, I know that it takes the investment of Capital to realize actual returns. James, you are helping the Church prepare to invest real Capital on this earth to assist in bringing souls to Jesus. We are God’s Voice, His Hands & His presence on this earth (and we need Capital to bring this harvest to fruition).